The founder of the Unification Church, Dr. Sun Myung Moon is known for his key role in the fall of Communism. President Reagan personally said, "We had the desire but without Rev. Moon we would never have stopped communism." I Got Revelation: "The Messiah is on the Earth"
If Rev. Moon had not established the Washington Times in 1982, many more problems would have occurred in the Western world. Primarily through the Washington Times and his other publications, Dr. Moon turns the power in the ideological Cold War. Washington Times was the most quoted newspaper and the source of 95 percent of the information on "Radio Free Europe" and "The Voice of America" during the Cold War. Through the founded by Dr. 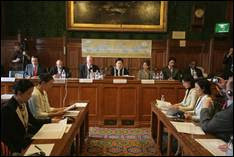 Moon organization "Victory over Communism", millions of public, political and religious leaders had been educated. This successfully prevented the invasion of Marxism in Latin America and many other third world countries. His work played a major role in electing Reagan as president. Dr. Moon is the main force that turned the west, and supported its leaders to fight this atheistic, totalitarian, inhuman system. This is one of the main reasons for the unprecedented persecution and spread false rumors against Dr. Moon and his Movement for Peace. The sources of such false accusations are few and they can easily be identified. Their objectives are far from the moral, nor good for society. But the truth can never remain hidden for long. 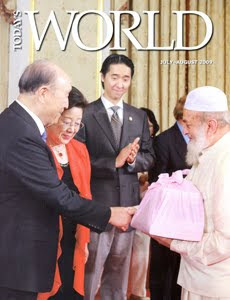 The fact that heads of state, Nobel Prize laureates, prominent scientists and religious leaders recognize and support the efforts of Father Moon for the construction of a new world, is eloquent enough in itself. I want you to understand the crucial role of the "Washington Times" in the opening up of Russia and the Eastern European nations towards democracy. There are many media in the Western world and America, but they didn't know which way to go. Therefore the media and many intelligent people as well were linked towards liberalism and were easily influenced by communism. They were leading the free world towards its own destruction. Therefore Rev. 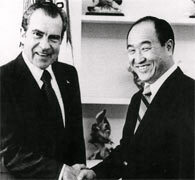 Sun Myung Moon founded the "Washington Times". If Rev. Moon had not established the Washington Times in 1982, many more problems would have occurred in the Western world. There were about 1700 newspapers in the US, but not even one of them was conservative. All the liberal media were silent about the Soviet strategies of infiltrating the West. They covered up all the problems of Communist countries but criticized everything in the free world. Only after the Washington Times was established were the Soviet infiltration strategies in the Western world exposed. Then those people like the CIA and others, who had never had a chance to publish their information about the activities of the Soviets in England, France, Italy and other Western nations, came to the Washington Times. These facts were finally made known to the public. With the publication of the Washington Times a new confrontation began in the United States. All the criminal and violent activities of the communists which had been covered up by the liberal press began to be investigated and exposed. This new trend was greatly influenced by the Washington Times. Based on information published by the Washington Times, the western radio stations that broadcast for the Eastern European countries (like Voice of America and Free Europe) began to report about the Soviet evil activities all over the world. This encouraged the Eastern European Satellite countries of the Soviet Union to recognize the Soviets for what they are and they became increasingly critical towards Moscow. I think every city square in America should have a statue of Sun Myung Moon for his having created The Washington Times. Who Played Key Roles in the Collapse of Communism? Marx and Lenin appeared to be on the verge of political and ideological vindication by the end of the 1970s; the feeble international response to the Soviet Union's outright takeover of Afghanistan did not bode well for the democratic cause. Who could have imagined that one decade later the Soviets' dreams of world dominance would have dissipated? It is naïve to assume that the demise of Soviet communism was pure chance. The Reagan presidency complemented by a "peace through strength" foreign policy played a key role in getting the United States "back on track" and facilitating the emergence of glasnost inside the former Soviet Union. A change in Americans' perception of Soviet political and military designs, undoubtedly fostered by the experience of the Carter years and by reports in conservative publications such as Reverend Moon's Washington Times, played a key role in allowing the United States to abandon its anti-military posture of the late 1970s and commit to achieving military superiority over the Soviets in the 1980s. Rev. Moon gave crucial support to Gorbachev of his policies of glasnost and perestroika. Rev. and Mrs. Moon entered Moscow in April 1990 and had a one-on-one meeting with Mikhail Gorbachev. Rev. Moon persuaded Gorbachev to allow religious freedom, to allow God to enter the Soviet Union. This meeting was crucially important in the sight of God. It was, the beginning of a peaceful process of the demise of the Soviet empire. Rev. Moon indeed motivated Gorbachev in the direction of peaceful reform. The greatest miracle that occurred in this century was the liberation of the Soviet Union without nuclear war. The threat of nuclear war was the single greatest concern of Rev. Moon. He said, "Thank God, not a single nuclear weapon was used against mankind since 1945." Why Rev. Moon Support President Richard Nixon? His Strategy: Love the communist people and educate them about how Marxism/Leninism was fatally flawed; offer them a counterproposal based on Godism, and help them achieve their ideal. Rev. Moon did not end communism, and I suggest whoever believes that lie take a look at North Korea and the royal family of Satan by Kim Il Sung, and Red China, the Judas of the United Nations, the Son of Perdition or Scarlet Colored Beast of Revelation carrying the Great Whore of Capitalism, as the Cosmic Canaan itself at the Cosmic Level. Where he stumbled is by marrying a Korean woman who was obviously not a black christian Baptist or Pentecostal member of God’s Third Israel; by which they are and were given the Blessing by God Himself for paying the ‘dues’ and singing the ‘blues’ of those who carried their crosses to Golgotha here in the land of the Free. The First Great Mistake is that Rev. Moon said that my Father Jesus did not arise in the flesh; and bone; as of the Resurrection; as even Doubting Thomas had to admit; thus Rev. Moon lost his “wedding garment” as having “sold” it to buy the double-edged sword his book “”Divine Principle” really became; but it could have been a Scepter of Resurrection had he said he was Elijah! But Rev. Moon did not even rise to the standard of the least of the Apostle’s that Thomas really was: no faith; no real progress on the Path of the Just. When he goes to spirit world Rev. Moon will find he has “no garment” as it was written of one who would be cast out “speechless” for just this reason. But Rev. Moon does not think the Word refers to him at all: he thinks he is “above” the Gospel for some unknown reason. Yet much of it is directed right at him. The Second Great Mistake Rev. Moon made was in saying that the Holy Spirit is a “female spirit”; when the Seal ( had he reached it) would have shown him that the Holy Spirit of God is Jehovah Himself; and this cannot be known until one has the Seal as I was given it when John came to me; to Seal the 144,000 that Rev. Moon Married when he was to Seal them instead; which would have been the Baptism of Fire where the Hate seen by the Arabs and the Jews in 1967 at the 144 hours of War and Hatred became seen opposed the the Summer of Love and Peace by the Children of all the Tribes of Israel. At the Gathering of the Tribes that began at the Pilgrimage it was the Street of Love as Haight Street became our Jordan: he missed this at the Visitation of God, to begin to raise the 144,000 Virgins from My Generation: the Children of the Resurrection who do not marry nor are they to be given in marriage; which Rev. Moon ignored. Yet these virgins are the Clouds themselves who first rise: dead in Christ, faithful into Death. They rise first. It is We, the children of the Resurrection, who are the Clouds; the Virgins who are the First Fruits unto God and the Lamb; and I speak for them as the least: for we stand for the Bride my City really is: a City Not Forsaken it shall be called: the City of St. Francis. The Third Great Mistake Rev. Moon made was in then ”Marrying” the Lamb to the Holy Spirit as his “Bride”; being as how the Holy Spirit is that of Jehovah Himself this is quite a bad mistake spiritually; for here Rev. Moon allowed the Gospel of Love and the Revelation of Truth as the 2 Olive Branches held in the 2 Hands of God that are the Spirit and the Soul seen in the Symbols of the Sun and the Moon which are the two Olive Branches: they are the two that fell in the Street of Babylon. These two were thus invaded by Satan as they symbolized the Bride and the Bridegroom; the Bride being she who was to abide in Love and thus from God to “prepare herself” for the Bridegroom as the Truth Incarnate; what happened instead is that San Francisco fell in the position of SODOM spiritually which then happened due to the fact that in his book “Divine Principle” on page 216 we have the picture of Rev. Moon marrying the 2 “male entities” of “Jesus the Son” and the ‘Holy Spirit of God Jehovah’ who is the “Shepherd” and “Father of Mercy” . This is where “Sodom” as the “Tail of the Dragon” invaded. The ‘great red dragon’ represents “Egypt: itself; the Kingdom of darkness. And as the Holy Spirit represents Jehovah the Shepherd or Lover of the Bride it was Rev. Moon who taught his followers wrongly that the Holy Spirit was “female”; his misrepresenting of the Holy Spirit of God is what allowed “Isis” as the “queen” of Egypt; the “counterfeit” female ‘holy spirit” whose name is “Mystery” to invade his book: and his work thus does not stand to the Fire of the Test by which God sees what is the True Gold; thus for Moon in his book theologically and themantically this was a complete literary disaster. Rev. Moon had mixed the soil of Korea with each of the 50 States; which now has polluted our country with his own white goddess Robert Graves identified as ISIS as that discarnate influence that is spoken of by his drunken followers with high praise in numerous errors in every portion of scripture that deal with the Holy Spirit. Thus Jezebel now has her own Asherah set up around which the Unification Church dances as the Maypole itself of Asherah, in the Groves of Ahab. the fallen King of Israel. So Why did Rev. Moon die as a Mortal Man as John the Baptist? For this following tragic and unneccesary reason: where Rev. Moon Fainted Completely is when and where in his own testimony he decided that he would consciously speak The Accusation of Satan the Devil that John the Baptist dared not even admit to himself. Yet John secretly feared that the report he heard within his mind was true; and so could not reject and defeat this whispering voice within his own breast, and so Satan invaded him and he died: the Accusation of Satan being that his father Zacharias had committed an act of Adultery with Mary by which Jesus was conceived: and this is what “killed” the Unification Church: the Error of John that was the “beam” in his “eye”; the “delusion” of his “mind“. Moon went from lying in an unconscious coma at St. Mary’s hospital at Seoul, Korea, to being buried in a Mausoleum; but the same Mary who he accused of sleeping with Zacharias is she whose virginity he therefore impugned with his unwise accusation of calling her a whore. This was a mistake, the same that John also believed and for which he died in his disbelief due to being invaded by Satan like Rev. Moon, but Rev. Moon tried to link his accusation to a figure called Tamar, who had tricked Judah into leaving his staff and ring with her when she played being a prostitute, because Judah would not raise up seed to her after his brother died, as he was supposed to do as WRITTEN in the Law; and he was then to have attended to his brother’s widow. Tamar did this so she could have children and thus was able to prove their parentage, by the Staff and Ring Judah had left with her, in lieu of the money. Adultery had nothing to do with this at all, as Tamar was actually trying to have Judah fulfill his duty as writ in the Law itself. Rev. Moon tried to turn this into a justification for “providentially justified adultery”: and to buttress his claim learned from Satan, that Mary slept with Zacharias, and that this was “OK” with God. But God is NOT a “hypocrite” who says “Thou shalt not commit adultery”. and then goes and has it done as being somehow “allowed”, which view in a total travesty of the Truth. John the Baptist should have believed his own mother Elisabeth about Mary, and separated from Satan with her. That Jesus was born nine months to the day after Mary entered the House was the TEST of GOD that John was to have OVERCOME, but he failed, just as his body, Rev. Moon, also failed as well. Was Prophet Muhammad a Terrorist? !